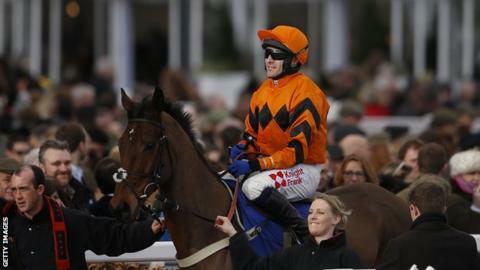 Cheltenham Gold Cup favourite Thistlecrack has been ruled out for the rest of the season with a slight tendon tear. The nine-year-old won his first four starts over fences, including a three-length victory over Cue Card in the King George VI Chase on Boxing Day. "The vet scanned him this morning and it's a slight tendon tear," said trainer Colin Tizzard. "We've seen it at every yard and it happens every year." Native River, the Hennessy Gold Cup and Welsh Grand National winner and Thistlecrack's stable-mate at Tizzard's yard, is now favourite for the Festival showpiece on 17 March. Cue Card, another Tizzard-trained prospect, and 2015 Gold Cup runner-up Djakadam are also challengers. Thistlecrack has won eight times in 11 starts over hurdles, but came second to Many Clouds in the Cotswold Chase at Cheltenham at the end of January. Many Clouds subsequently collapsed and died after the winning post. What a blow for his owners, the Tizzard Team, Tom Scudamore and the horse's fans - but also for jump racing. Thistlecrack really was the new star turn, and we had come to hang our coat on him in terms of generating interest. He is also the latest big-name for the sport's Cheltenham Festival in March to fall by the wayside - after Annie Power, Faugheen, Sprinter Sacre, Don Cossack and Coneygree - and none of the winners of the main races from 2016 will be back this time. As for Thistlecrack, there's no reason he will not return, although the big question is when. A defence of the King George in December looks touch and go, so maybe in time for the 2018 Gold Cup.